You dont need to be a baker to make use of this handsome bakers rack! 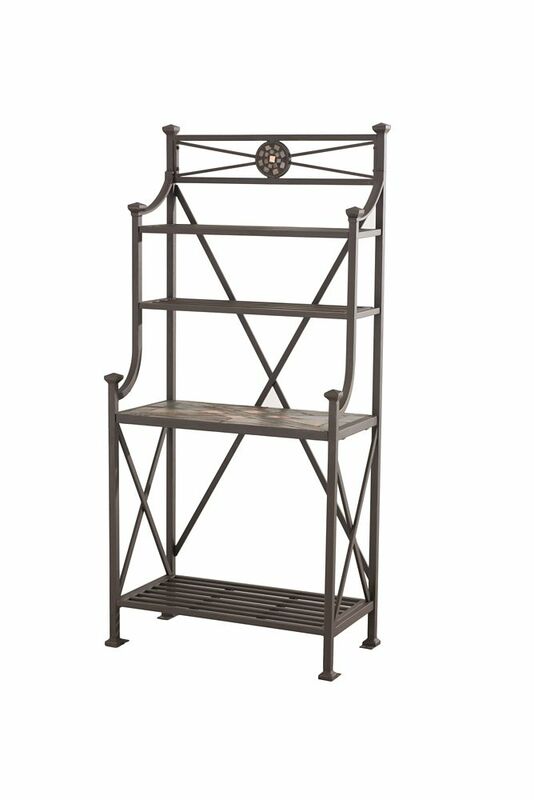 Featuring natural slate counter tops with gorgeous copper inlays, detailed framework, and 4 separate shelves for storage, this rack is the complete package: beauty and handiness in one unit. Built from durable aluminum and steel this rack can handle all that you might wish to store on it, from wine bottles to plants to outdoor serve ware. A brilliant chrome finish and contemporary design make the Honey-Can-Do Chrome 2-Shelf Urban Baker's Rack the perfect blend of style and functionality. Its sturdy, commercial-quality frame features 2 thick, adjustable, grid-style wire shelves that ensure easy cleaning and simple, no-tool assembly. The rack also includes a solid maple cutting surface, bonus top rail for spices and leg levelers for uneven floors, creating a convenient solution for organizing and maximizing your kitchen space. The Stainless Steel Folding Work Table is a great way to easily gain additional counter space in the kitchen, craft room, or workshop. It can even be used outdoors as a serving area while entertaining, then simply fold it flat and store it away. Fully portable, this work table is set on smooth rolling casters, making it easy to manoeuvre while in use and locks in place for stability. A lower wire mesh shelf provides additional storage. Durable stainless steel construction. Size: 38-inch H x 30-inch W x 24-inch L. Colour: Stainless Steel. Some assembly required. With stringent quality control methods, Honey-Can-Do confidently offers a limited lifetime warranty on every product they make. The Real Solutions by Knape & Vogt 12-inch Tray divider in frosted nickel helps provide vertical storage to organize cookie sheets, trays and pans and help keep them from falling over (cookie sheets, trays and pans sold separately). 4 clips (included) screw into the cabinet (cabinet not included). Installs with 4 screws (not included). The Real Solutions by Knape & Vogt Sink Front Tray turns a false-front panel into usable space. A great way to make the most of unused space in the kitchen or bathroom, the tray is designed for use with either scissor or euro-tray hinges (false-front panel and euro-tray hinges sold separately). Crafted with durable polymer material, the 2-inch depth offers a handy way to reduce clutter and keep small items easily within reach. Hansel Baker's Rack You dont need to be a baker to make use of this handsome bakers rack! Featuring natural slate counter tops with gorgeous copper inlays, detailed framework, and 4 separate shelves for storage, this rack is the complete package: beauty and handiness in one unit. Built from durable aluminum and steel this rack can handle all that you might wish to store on it, from wine bottles to plants to outdoor serve ware. Hansel Baker's Rack is rated 4.0 out of 5 by 2. Rated 5 out of 5 by RL from The Sunjoy Baker's Rack is strong, sturdy and very nice looking, with the 1 slate mosaic shelf & ... The Sunjoy Baker's Rack is strong, sturdy and very nice looking, with the 1 slate mosaic shelf & matching medallion at the top of the unit. It hold our outside plants, extra watering can and plant tools. It's handy and elegant, all at the same time! Rated 3 out of 5 by BK from Fairly easy to assemble except the slate shelf, although beautiful,... Fairly easy to assemble except the slate shelf, although beautiful, was very very heavy and the holes in the shelf and the brackets to which there were to be bolted did not line up. Although described as outdoor it seems a little prone to rust. Quality is bit lacking for price point. How many inches in clearance are there from the ground to the bottom of the lowest shelf? You may call Sunjoy Customer Service 1-866-578-6569 from Mondays to Fridays 8:30 Am to 5:30 PM EST.